Eclipse Magnetics’ FiltraMag FM2.0 magnetic filters. A car manufacturer was looking for a more effective method to solve the problems associated with particulate building up in the coolant. 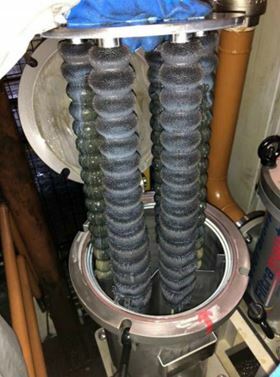 Eclipse Magnetics' high-performance filtration systems recovered the particles and effectively removed them from the process. A car manufacturer has benefited after MMTCI Group installed magnetic filtration units on its gear box shaft manufacturing line. The AutoMags, which are fully automated filters designed and manufactured by Eclipse Magnetics, have reduced the level of contamination in the coolant liquid, improving surface finish quality of components and the efficiency of the manufacturing process. The manufacturer has also benefited from a reduction in downtime that used to be a result of rectifying the problem. The material machined by the car manufacturer is steel grade 27 CrMo4, which is used in turning, drilling, and deep drilling processes. Due to the nature of the machined material and the application process, the coolant used had a tendency to become saturated with particulate. The car manufacturer’s initial situation involved a centralised media-based filtration system (threshold 340 µm) with a volume of 92 m3 and 800 m3 per hour of water. 14 machines were connected to the central filtration system. A more effective method of filtration was required to solve the problems associated with the particulate building up in the coolant. MMTCI Group’s environmental division installed Eclipse Magnetics high-performance filtration systems in order to recover the particles that were collecting in the coolant and effectively remove them from the process. An initial solution of two FiltraMag FM2.0+ were installed in order to protect the two machines equipped with high pressure pumps. The FiltraMags were installed in parallel for a flow of 30 m3 per hour. FiltraMag FM2.0+ is a high performance magnetic filter with full stainless steel construction. Its high intensity magnetic cores make it 100% effective for use with materials which have lower magnetic permeability, and it can be used to remove both magnetic and non-magnetic contamination. Eclipse Magnetic’s unique Dual Flow TechnologyTM maximises collection capability, and its non-block, easy clean design offers rapid return on investment. The second phase included the installation of a set of Eclipse Magnetics magnetic filters, which enabled the filtration of the full volume of fluid. This closed-circuit assembly is installed directly on the central filtration system and consists of two AutoMag AM12s, a separator drum for the evacuation of the sludge, a plunging pump, and the electric/pneumatic steering box. The AutoMag is a fully automated magnetic filtration unit which is ideal for 24/7 machining operations. With high contamination collection capacity and an ability to handle high flow rates, the Automag was able to offer a solution for the car manufacturers’ problems with contaminated coolant, enabling the effective removal of contaminate. Before the Eclipse Magnetics filters were installed by MMTCI Group, the machining liquid had a contaminate reading of 556 parts per million. After a week of use, this had reduced to 139 ppm, and is now less than 100 ppm. MMTCI Group’s environmental division develops and installs high performance filtration systems in partnership with Eclipse Magnetics in France. MMTCI, and more specifically its environmental subsidiary, develops specific filtration systems that meet the constraints of a variety of industry sectors. Eclipse Magnetics’ separation systems satisfy the performance and surface finish standards demanded by the food industry. Eclipse Magnetics has supplied its Filtramag system to Bombardier Recreational Products to help improve manufacturing efficiency at its site in Austria. Eclipse Magnetics can now offer customers Sesotec’s range of X-ray detection systems, magnet systems and metal detection systems.